TNCS Performs at Confucius Institute Day! 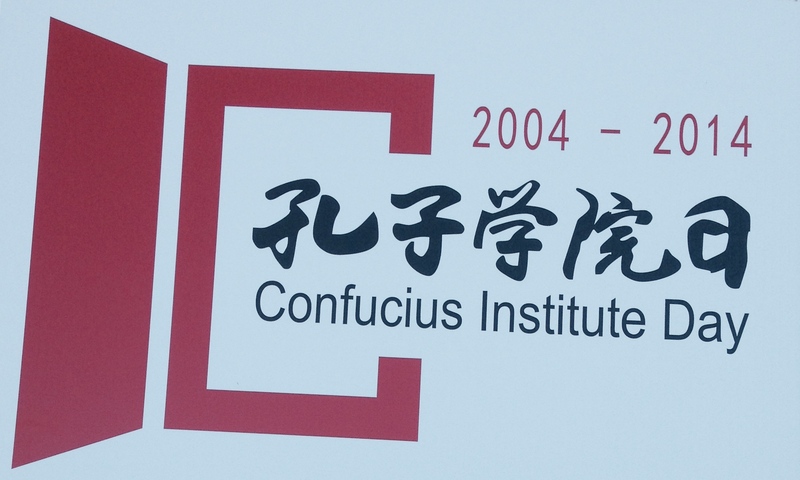 The Confucius Institute at Maryland celebrates 10 years! This has been a week of anniversaries for The New Century School! With the publication of this very post, Immersed turns 2. The Confucius Institute at Maryland (CIM), however, who supports TNCS’s Mandarin Chinese program in multiple ways, hit double digits! To celebrate its 10th anniversary, the University of Maryland hosted Confucius Institute Day at the College Park campus, and TNCS kindergarten and elementary students took a field trip to participate in the revelry. It was a gorgeous fall day with warm temperatures and a blue sky, just perfect for a field trip and an outdoor event. TNCS kindergarten and elementary students gather for a group picture, all proudly wearing their red shirts. TNCS students perch on a map of China showing each province. This first-grader appreciated her fan on this 80º day! TNCS students got to sign their names on a construction paper rendition of China’s Great Wall. Two dragons—one silver, one gold–weaved their way through the crowds, stirring excitement for the festival that was about to begin! To set the mood, Chinese drummers beat out a steady, thumping rhythm for the dragons’ parade. A closer look at the gold dragon’s face. A closer look at the silver dragon’s face. Costumed performers pose for a photo prior to their performance. Established with support from the Office of Chinese Language Council International (also known as Hanban), CIM “promotes the understanding of China today through the study of Chinese language, culture, ethics, and philosophy.” CIM also provides many of TNCS’s Chinese interns and teachers and is a sister school with Xiamen University in China. The festival opened with the Lion Dance—something the lucky TNCS students in attendance will not soon forget! This dance that mimics a lion’s movements by dancers sharing an elaborate lion costume is performed during Chinese traditional, cultural, and religious festivals; special celebrations and ceremonies; or to honor special guests. To show their appreciation for CIM’s invaluable support, TNCS students and language staff put on a show. Each division—K/1st, 1st/2nd, and 3rd/4th—did a musical performance for the crowd of hundreds. The audience was charmed. In fact, K/1st teacher Teresa Jacoby overheard some high school students expressing their amazement that such young kids were so clearly proficient with the Mandarin Chinese language. They certainly work hard! The event emcee announces TNCS performers to the happy crowd. Kindergarteners don their costume hats to perform their doggy song! Kindergarten/1st-grade performers sang and pantomimed a song about a dog wishing for a bone. The third- and fourth-graders performed a drum song. This TNCS kindergartener really enjoyed the show! TNCS students were thrilled by the performances! TNCS students got their share of Chinese culture at this event. Dances, acrobatics, opera, and music kept them awestruck all day. The first field trip of the year was a huge success, thanks to TNCS Chinese staff! Xièxiè xiè lǎoshī! 谢谢谢老师! This entry was posted in Early Childhood Education, Elementary Education, Multilingual Education and tagged Chinese lion dance, Confucius Institute, Confucius Institute at Maryland, Mandarin Chinese, Mandarin Chinese program, multilingualism, The New Century School, University of Maryland, Xiamen University. Bookmark the permalink. ← TNCS Students Get the Wiggles Out and the Learning In!